1) Jesus Christ is one and only one person, and that person is truly God. 3) Therefore a person who is God died. 4) If a person who is truly God died, then God died. There is a direct parallel to the question of whether or not Mary the mother of Jesus was theotokos, the mother of God or the “God-bearer.” Any orthodox theologian should be able to sympathise with the concern that this can, if taken a certain way, have heretical implications (implying that God had a beginning), while understanding that if it is understood in the intended manner, its denial has heretical implications.2 But it is actually rather simple. For if Mary is the Christ-bearer, the mother of Jesus, and if Jesus is truly God and truly man as orthodoxy demands, then of course Mary is the Mother of God, the God bearer, because the person that she bore is truly God. She is the mother of a man and the mother of God, while being the mother of only one person (setting aside the question of how many other children Mary might have had, if any), because this one person is really a human being and is really God (this is just what it means for a person to have a complete human nature as well as a truly divine nature). There is a natural reluctance on the part of some to say that on the cross God died because the statement can be (but should not be) construed to mean that everything that is God died. To say that Jesus’ human nature died but not his divine nature is problematic for a couple of reasons. In the first place it just doesn’t make sense. Natures do not do anything, including die. To have a human nature is just to have all the properties required to be human. There is more than one way to think about this, but whatever we mean we should not think of Jesus’ human nature amounting to a human being all by itself, otherwise Jesus is just the co-operation of a human person and a divine person, which is the heresy called Nestorianism. Persons have a nature, and it is persons that live and die (and think, feel, believe etc). In the second place, even if we could overlook the heresy of making Jesus’ human nature into a personal entity all by itself capable of dying, to say that Jesus’ human nature might die while the divine nature did not would amount to a separation of the human and divine natures in Christ, which is precisely what Christological orthodoxy sought to deny as a possibility. It was the Gnostic heresies, rather than Christian orthodoxy, that portrayed the victim on the cross as only human, while the spirit of Christ was untouched by such base suffering (leaving the human Jesus to cry out that he had been abandoned, even by the Spirit of Christ), for God cannot become human, let alone suffer. Consequently, so long as we maintain that Jesus is only one person, that dying is something done by persons and that Christological orthodoxy is correct to maintain the distinction but inseparability of Christ’s human and divine nature, then we are left with no choice other than to affirm that God, in Christ, died. In addition to being heretical, to deny that God really died has unjust implications. For God to take a third person – a person who is not God but a bystander – and subject him to death as an atoning sacrifice is unjust. It is akin to me robbing a third party in order to wipe your debt to me rather than paying it myself or absorbing the loss. You may find it very hard to find a way of expressing the idea that God died in a detailed manner that does not pose problems for orthodoxy. I am not saying that it cannot be done (in fact I think it can be done). But whatever the correct formulation, it will be hard. As a short-cut to the answer, in lieu of doing the hard thinking required, you might be tempted to join those who, before engaging in this thinking, decide that the task is probably impossible and therefore the answer not worth figuring out. As a result, the proposition that God died is branded heresy and dismissed without any mental effort. This happens. But it is wrong. If you do not believe that on the cross God died, you should probably reconsider which religion you subscribe to, because it is not Christianity. Posted on November 20, 2013 July 16, 2018 by GlennPosted in theology and biblical studiesTagged christology, death of Jesus, Jesus, theology. Previous Previous post: Where did Elijah go? If your trinitarian (or binitarian) doctrine of God forces you to say God died, then you should probably reconsider whether that trinitarian conception reflects original Christianity. Michael, are you implying that God got a third party to atone for sin? I’m saying the Father is God and Jesus is a man, and a man only, whom God has been pleased to exalt to the position of Lord (Acts 2.36); and this is the doctrine, yea, the creed of original Christianity (1 Cor 8.6).
. . . being justified as a gift by His grace through the redemption which is in Christ Jesus; whom God displayed publicly as a propitiation in His blood through faith (Rom 3.24-25). 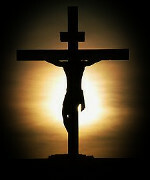 Yet God did not die on the cross; the man Jesus did (despite your reading of Acts 20.28). Right, Michael, but in your understanding of the atonement, God and Jesus did it, because God got a third party, namely Jesus, to die. That’s unjust. Jesus wasn’t thought of as a man only. Acts 20:28 is but one piece of evidence for this. This all makes perfect sense. But isn’t it equally true to say that “God did not die”, since neither the Father nor the Spirit died and they are both equally divine? I think those who object to ‘God dying’ probably have Chalcedon in the back of their minds. I think it is crucial to maintain that Jesus died in his human nature and not his divine, since God doesn’t have a body and so cannot be subjected to death ‘in his divine nature’. However, since the person of Christ died, and not the nature, it is perfectly true to say that God died. That’s the scandal of the cross, a stumbling block to “Greek” arians like Michael above (1 Cor 1:18-25). I don’t see how the atonement is unjust unless Jesus is God. What’s your argument? Re: Acts 20.28: frankly, as a fan of you and your blog, I am surprised you would make any appeal to this text as evidence that the earliest Christians regarded Jesus as actually God, and even suggest that we should suspect suggestions to the contrary as concessions to liberalism. Textually, whether [την εκκλησιαν του] κυριου or θεου should be read is very unclear, but regardless of that even the extremely trinitarian NET New Testament, renders δια του αιματος του ιδιου as “with his the blood of his Son” i.e., “through the blood of his own son.” Dan Wallace, et. al. have hardly made this translation decision in concession to liberalism. I’m not an Arian, and the Apostle said the message of Christ crucified–not Christ is actually God yet fully man too–was foolishness to Gentiles; he said it was a stumbling block to Jews (1 Corinthians 1.23). And do you really do well to call a fellow Christian a derisive name? Or do you agree with Glenn and believe I’m not a Christian? May I ask, what do you (Glenn, Michael, Chris) mean by death? Does death mean oblivion? A body separated from a soul? Or some other type of separation (perhaps more pertaining to our standing with God)? If you believe that Jesus is not equal to the Father then yes, you are an Arian. Although if you believe he was only a mere man, that’s probably even worse. The 1 Corinthians reference was because of Pauls ultimate point: Christ is the wisdom of God. And since God’s wisdom is eternal, Christ is eternal, not a mere man. That’s a real can of worms you’re opening there! I lean towards physicalism and the belief that we cease to be conscious upon death (although not yet completely sure) and that is the view that Glenn takes. I’m not sure about Michael. As I said, Michael, Acts 20:28 “is but one piece of evidence” that the early Christian community saw Jesus as divine. And I do not really understand your remark about a concession to liberalism. I do not see non-Trinitarian views as “liberal,” I just see them as mistaken. This is the point. The two parties concerned with the problem of sin are God and humanity. Humanity has sinned against God, and these are the two parties that need to be reconciled. What you are proposing is that God called on a third party to suffer and die to make this happen, which is unjust, since the third party is not God (the wronged party). The Gospel message is one in which God did for humanity that which we could not do. But you seem to think that a human being (Jesus) did live up to God’s righteousness and yet God had him die for everybody else. Nicole, by death I mean no life at all. Not life somewhere else, not life in another form – I mean the total end to life. Chris, we can’t say “God did not die,” but what we can say is: “Not everything that God is died,” because neither the Father nor the Spirit died. As for the remainder, part of the problem of what one means when they say that Jesus died “in his human nature.” Natures don’t do anything. Jesus, who is a person with two natures, died. The way that I have heard some Christians express this is troubling. They almost want to say that the human nature died and the divine nature lived on, both making each nature like a person (! ), and also separating the natures from each other, a possibility denied by Chalcedon. When you say that Jesus/the Son died, and that death is the “total end of life”, do you actually mean to say that a member of the Trinity ceased to exist? Ross – no, the Trinity was still the Trinity. I say more about that in Divine Timelessness and the Death of Jesus. By “died in his human nature” I simply mean that death is something that only a finite being can experience. I’m not suggesting that a ‘nature’ can be subjected to death. This is why the Son of God had to become a man – to live a blameless human life and then to experience death. Re: the atonement. It appears you are presupposing, or taking for granted, a penal substitution theory of the atonement. Is this correct? Re: Acts 20.28: am I misreading your footnote, then, that you affixed to the text in the post? The note appears pretty clearly to suggest that those who disagree with your reading of the text are making a “concession to liberalism,” which is rather dogmatic. As for the significance of the text vis-a-vis the identity of Jesus, I think the most you can claim is the text is possibly evidence Paul regarded Jesus as actually God. At any rate, surely you can appreciate that unitarian Christians like me (and we are Christians, i.e. confessors of the lordship and resurrection of Jesus – Rom. 10.9-10), are not bothered by a verse so uncertain in terms of original text and actual meaning. Michael, as said, Acts 20:28 is part of the evidence, yes. I have not dogmatised about the textual evidence, although I noted that early Christians like Ignatius of Antioch apparently read the passage as I do, and that is decent evidence for that reading. As for the second question, no, I am not assuming a penal substitution model of the atonement. What I have said is also compatible, for example, with a Christus Victor model. Whatever the model, you have God getting a third party, who is neither the offender nor the wronged party, to die. Re: the atonement, I just don’t find your argument compelling. First of all, God was not a debtor to Jesus such that God could not justly take back the gift of life Jesus enjoyed as one of God’s human creatures. Secondly, God did not directly put Jesus to death, anyway. Rather, according to Peter (Acts 2.23), God handed over (εκδοτον) Jesus into the hands of sinful men, thereby permitting them to put Jesus to death according to the desire of their sinful hearts. Thirdly, Jesus most magnanimously consented to this. He certainly was not “robbed” by God, as your analogy on this point in the post suggests. “No one takes it [my life] from me; rather, I give it up from myself” (John 10.18). God did not make Jesus do anything. He presented the course to Jesus, and Jesus freely consented, though not without hesitation (Gethsemane). So I just don’t see any injustice on God’s part in any of this, given a unitarian Christian conception of God and Jesus. It appears you think you argument is self-evident. It may be to you, but it is not to me. Also, I still reject the way you describe the atonement, in a unitarian Christian theology, as “God getting a third party to atone for sin.” In the atonement, God gave over his own precious one (Acts 20.28) to evil men and the evil forces behind them, so that he [God] might safely pardon sinners without thereby compromising his good moral government (Rom 3.21-26). And Jesus freely consented to this, even though it appears he did not understand it completely (thus the Gethsemane episode) out of love for his Father and love for the world. What sacrifice from both God and his Son! Yes, only Jesus died. God did not (by nature, he simply cannot die). But to take that point and describe God as “getting a third party to atone for sin,” is an uncharitable way of describing what God has done in the atonement on a unitarian conception of God and Jesus (even if you do not intend this). But clearly I am not one of those who feel it improper to think of the death of God on the cross, so I do not understand why you would think that I am affirming that the alternatives are a concession to liberalism. I would also add that I had Trinitarians in mind. This is irrelevant, as the notion that God was a debtor to Jesus was never part of my argument. So your first reply can be set to one side. This does not help, because handing an innocent third party over into the hands of people who you know intend to murder them so that you can deal with those murderer’s offence against you is unjust. So this reply too can be set aside. This is true, and I think it is your only substantial reply. But I do not think it really helps you. If I was wronged by somebody, so I came up with a scheme where I sent my son (who is quite innocent and also separate from me) to suffer and be killed by them, then even if he consents in spite of his fear, I have still come up with a plan that is unjust and uses a third party as a means to my end. Lastly, it does not matter that you don’t like the reference to a third party, preferring instead to talk about the preciousness of Jesus. But if you are right, Jesus is a third party. If you are right, then Jesus is not the wronged party (God) and he is not the offender. So he is a third party, and your view has God using a third party who was innocent and who was not a party to the offence step in and suffer and die for other people. This is unjust. But if Jesus is truly divine, as the Scripture and the Christian faith teach, then things are different, for Jesus is the one against whom we have sinned, and his death is a case of the wronged party choosing to suffer and die so that the wrongdoers can be freed of their burden of debt. This is a case of a self-giving God. Thank you for clarifying regarding your footnote on Acts 20.28. But I was reading it correctly. To note that some (trinitarians) regard the alternative readings/translations of Acts 20.28 as “concessions to liberalism” throws that idea out there so to speak, tacitly endorsing it. Only if read and translated the way you have do you have a verse in the Scriptures explicitly stating that God died. What purpose does the footnote serve you unless it is to forestall any questions regarding the proper reading/translation of the verse? Premise 1: God always acts justly. Premise 2: God sacrificed Jesus, a man and a man only, to atone for the sins of the world. What I need, evidently, is a substitute for the second premise that you already agree with. With that in mind, let me ask you, what do you make of God’s actions recorded in 2 Samuel 12? Was he just to give David’s wives over to David’s son as punishment for David’s sin? Even more to the point, was he just to strike down David’s newborn child as punishment for David’s sin? No I do not endorse it. I need no argument for this, I need only to inform you. Moreover, as written, my footnote does not tacitly endorse the idea. Instead I am attributing the idea to others. Michael, I actually don’t believe that you think this is some sort of private intuition, and I think that you share it as well. I think your rejection of this “intuition” is not genuine, or if it is, you’re approaching the Scripture in a way that you don’t approach life in general, which is special pleading. You owe the government $100,000. You can’t afford to pay. The government then decides to come up with a plan to get that money back. Their plan is that I will pay it back for you. You and I had no relationship up to this point, and the government came up with this plan, not me. I’m horrified by the plan. But I acquiesce to it, and sell everything I have, paying off your debt. The government then treats you as absolved. Is the government’s plan just or unjust? Try to imagine how you would answer that question if we were not already talking about the death of Jesus, because I realise there will be a temptation to find the government’s actions to be just, in order to salvage your position on the death of Jesus. The reality is that in virtually any situation in everyday life, you would regard this as unjust – as would anybody. Trying to concoct a “justice” that flies in the face of this and then attributing it to God makes a mockery of our praising God because he is good and just. If good and just can simply mean anything, then they mean nothing and they are not a praiseworthy feature of God. Your counter-examples from the Old Testament are ineffective here. You first mention the fact that David’s wives – or at least some of his many, many wives, would go to his fellow Israelites. But what is the objection here? Who is being punished? Not the wives, as far as the text indicates. There’s no reason to think that it’s so terrible for a woman to go from being a nameless woman in the King’s harem (which is basically what it was), so unimportant to him that he would have a man killed to steal Bathsheba, to being the wife of a man who will in all likelihood love her with devotion. No, David was being punished here. That was the point. And since David was the wrongdoer, there is no issue. I do notice, incidentally, that in spite of you not embracing penal substitution, your Old Testament examples suggest that you do. The death of David’s son is a much harder one, and anyone who thinks that it presents no difficulty at all is just not thinking. But the question remains: Who was being punished? In order for the same concern to exist here as in your model of the atonement, the baby would need to be punished for David’s sin, and not David. Your use of this example thus presupposes that David is not punished here. And yet it is clear that David was punished. His son died. The baby’s loss of life is David’s loss of a son and heir as King. But there is no analogy here in the atonement. The death of Jesus is not a loss at all to sinners. So these examples just won’t do what you want them to do, and your view of the atonement and God’s treatment of a third party is not tenable. I should add – I’ve probably laid out this particular argument in as much detail as I intend to now and may not keep it up, but I’ll certainly read your reply if you are inclined to offer one, Michael (but I’ll understand if you don’t – these things can go on without end!). I now realize the problem is we are presupposing different understandings of the atonement. I do not believe the guilt of sinners was imputed to Jesus and he was punished for that guilt (penal substitution theory). Nor do I believe that Jesus paid the debt of sinners (satisfaction theory of the atonement). You have said you do not presuppose the penal substitution theory of the atonement, but you do appear to presuppose the satisfaction theory. This appears to me to be the import of the analogy you drew with paying pack a $100,000 debt to the government. Now, as for my counter example from the Old Testament, I beg to differ that it is ineffective. You are right that God is punishing David by giving his wives over to his son and by putting to death the newborn child begotten from the affair with Bethsheba. But you have incorrectly assumed that I was saying differently and that therefore I presuppose a penal substitution theory of the atonement. But, again, I agree that God is punishing David in both cases. What I hoped you would gather from the text is that the logic of the text is that God is able, as moral governor, to spare David’s life (2 Samuel 12.13) because God puts to death David’s child (and gives his wives over to his son) (2 Samuel 12.14). In other words, according to the text, only because God puts the child to death is God able, as moral governor, to spare David’s life. Thus God explains that the child is being put to death because by committing his gross sin, David “had made the enemies of YHWH show utter contempt”; and, therefore, “the son born to you will die” (2 Samuel 14). As moral governor, YHWH could not allow his name to fall into such contempt. To do so would be to act unrighteously as moral governor. He must maintain his honor. God did so in the case of David’s transgression by putting David’s child to death. And thus God is able to spare the life of David while vindicating himself as lawgiver and vindicating his law through the death of David’s newborn child. This is very similar to how the atonement in Christ enables God to safely pardon repentant sinners. As Paul explains in Romans 3.21-26, the locus classicus on the atonement in the New Testament, the atonement was a demonstration of the righteousness of God in overlooking sin in past times (Romans 3.25) and in presently justifying those who put faith in Jesus Christ (Romans 3.26). The idea is that as moral governor of his rational creatures, God is obligated to maintain the integrity of his law. To do otherwise would be unrighteous, or unfaithful, even unloving on God’s part, inasmuch as God’s law is for the good of his rational creatures. How does a moral governor maintain the integrity of his law? He/she does so through punishment, because punishment deters future transgression. And this is precisely the dilemma for God. He takes no pleasure in the death of the wicked (Ezekiel 33.11), that is, he takes no pleasure in punishing the criminal. Rather, he desires to forgive. In this precise respect, his ways are not our ways and his thoughts not our thoughts (Isaiah 55). But, again, to forgive the transgressor rather than punish is to promote lawlessness, and that is an unrighteous, even unloving, act by a moral governor. Paul’s point in Romans 3 is that because God, as moral governor, had overlooked transgression in former times, through his forbearance, God’s righteousness as moral governor was in question. Moreover, to forgive in the present time transgressors who put faith in Jesus likewise calls into question God’s righteousness, or faithfulness to his obligations, as moral governor. Enter the atonement. The atonement is God’s means of pardoning transgressors without thereby promoting transgression, which again would be unrighteous, even unloving on God’s part since his law is for our good. Through the atonement, God is able to safely forgive repentant sinners as his loving heart desires (“I take no pleasure in the death of the wicked”), yet without promoting further transgression. By punishing transgressors God reveals to his subjects that he takes his position as moral governor and his good laws seriously. In this way, punishment is aimed at motivating people to keep God’s good laws. In the atonement of Jesus, God sends out the same “message” to his subjects (thus Paul’s emphasis that God “publicly displayed” προεθετο Jesus in the atonement – Rom 3.25). He conveys to them that their obedience to his good laws is so important to him—since they are for their own well-being—that he will not just willy-nilly forgive transgressors. On the contrary, he will forgive only by sacrificing what is most precious to himself, namely, his perfect son Jesus Christ (John 3.16, Romans 8.32, etc. ), in order to show just how very serious it is for him to forgive. Moreover, the atonement is a picture to all transgressors of what sin deserves and what the unrepentant should expect for their sin: death. In this way, too, the atonement enables God to safely pardon the transgressor without thereby promoting transgression. So returning to 2 Samuel 12, my point is that as, according to Romans 3.21-26, the death of Jesus enabled God as moral governor to spare the lives of transgressors in the past and enables him as well to spare transgressors lives in the present without promoting transgression which would be unrighteous, so too the death of David’s son, according to the logic of 2 Samuel 12, enabled God as moral governor to spare the life of David without promoting transgression, which again would be unrighteous for God to do as moral governor. In the latter case, David’s son was clearly a “third party.” That is, to state the obvious: David’s son was not God and was not David. And since God did this, clearly it was not unjust. Therefore, neither was God unjust in the death of Jesus in the atonement because Jesus is not God. Indeed, to hold that God was unjust in the atonement if Jesus is not God, as Christian unitarians maintain, is unwittingly to hold that God was unjust in putting to death David’s son as recorded in 2 Samuel 12. This is why I asked you about 2 Samuel 12, and this is why I believe the text is quite relevant to our argument. Actually, Glenn has you on more than this. As he noted, that intuition would apply to Christus Victor as well. And if you reject all forms of satisfaction theories as well as Christus Victor, there isn’t really a whole lot of wiggle room left as to why Jesus needed to die at all. In the end you say that Jesus died because God had to give something up in order to forgive sin. This makes no sense at all. Forgiving sin is giving something up, because God will no longer punish those whose sin is atoned. That’s what is given up. So what was poured out on Jesus is the equivalent of the punishment for sin. Agreed. But as I read through this exchange, you haven’t provided any means of getting around the considerable problem of justice that Glenn has set out. It’s actually a problem I had not considered before when thinking about the issue of Jesus’ divinity, and now that I have thought about it (thanks to this discussion), I cannot un-see it. It’s quite striking! Remarkably, I don’t think you have understood a word I said. Who said anything about the Christus Victor theory of the atonement? Certainly not me. I explained what Paul says about the rationale of the atonement in Romans 3.21-26, which is the most important statement on the atonement in the New Testament. The atonement was necessary as a demonstration of the righteousness of God, as moral governor, in overlooking sin in the past and justifying sinners in the present who believe in Jesus Christ. This is not a satisfaction theory of the atonement, nor is it the Christus Victor theory. As for 2 Samuel 12, you simply have not reckoned with the logic of the text, especially verses 13-14. But as I have already clearly explained that logic in the post, I will not explain it here again, as I doubt it will help. For you do not seem intent on understanding my arguments. If you can fairly, that is, accurately, restate my arguments back to me, then I will be happy to interact with any criticism. Otherwise I won’t. It’s ironic that you think I didn’t understand you when you think that I understood you to be advocating a Christus Victor view. Ah well, never mind. There’s little point in saying more. No, Kenneth, what you said in the sentence you sound-bited is, “If you reject all forms of satisfaction theories as well as Christus Victor, there isn’t really a whole lot of wiggle room left as to why Jesus needed to die at all.” So you are either telling me I have no explanation for why Jesus needed to die, which is the more uncharitable claim since I explained at length from Romans 3.21-26 why Jesus needed to die. Or you are implying that I must have a Christus Victor view of the atonement, since I reject satisfaction theories and according to you there are no other viable explanations for the necessity of the atonement other than the Christus View or a satisfaction view. I chose to read you making this less uncharitable claim, but nevertheless false claim. At any rate, clearly you have not understood my explanation for the atonement, and it is evident to me that the reason for that is that you did not take the effort to do so. The same goes for what I wrote on 2 Samuel 12. Like I said, I am happy to interact if you make an effort to understand what I am saying. So Michael, first you say that I am attributing a Christus victor view to you, and now – without acknowledging that this claim was incorrect, you say that my claim is simply uncharitable. You simply misunderstood me as attributing a view to you when I evidently did not. In fact I said that you do not hold to the satisfaction view OR Christus Victor. I was clear about it. I maintained that by rejecting both of these views, as you do, you have left yourself with no adequate theory for why Jesus needed to die. You’ve similarly misrepresented what Glenn said (even though his claim in the footnote was quite clear). Your new protest is that I didn’t understand your explanation for the atonement. This is not correct. I did understand it and I explained why it falls short. You can simply brush off what I said about it and not reveal what your response would be if you chose to engage, but don’t patronise anybody by implying that I didn’t understand. I gave a reply, and you won’t address it. I similarly explained why your response to Glenn about King David fails. So you’ve chosen to stop replying to arguments, which is OK. Just say that you don’t want to address criticisms. Any time you like, you can come back to the discussion and address the specific criticism I offered for your comments about the atonement. It’s up to you. But trying to present others as failing to understand you – when it is perfectly clear that you’re misunderstanding what they are saying – even attributing to them the opposite of what they said – is unproductive. Once again, even if you think you did, it is nevertheless the case that you did not understand my explanation of the atonement, nor the force of 2 Samuel 12.12-13. Frankly, I am not surprised, for you appear to be uninformed regarding the history of reflection on the atonement. You said, essentially, that Christus Victor and satisfaction theories of the atonement exhaust the possible theories as to the necessity of the atonement. Have you ever heard of the governmental theory? The moral influence theory (or rather theories)? The ransom theory? Etc. Now if it were only that you were uninformed, then I would be happy to correspond with you and carefully walk you through what I laid out to Glenn on the atonement in Christ and the reductio from 2 Samuel 12.12-13 of his accusation that unless Jesus is actually God the atonement is unjust. For all of us are coming from a position of relatively ignorance on things. But it seems to me that you are not merely uninformed: you also appear to not be open to persuasion, at least on the matter of whether Jesus is actually God or not. And that keeps you from really listening to what I have to say on the atonement and 2 Samuel 12.13-14, since it occurs in the context of my argument with Glenn regarding the nature of Jesus. Therefore, it would be fruitless for me to spend my finite time trying to inform you and persuade you of something you are not open to. And it would be fruitless for you too. A waste of time all the way around. Also, I have not intended to misrepresent Glenn in anything I have written. I did think he was attempting to implicitly endorse the idea that other readings/translations of Acts 20.28 than the one he gave are to be suspected of concessions to liberalism. But I take his word for it now that he was not. And regarding what you wrote in your first paragraph on my explanation of the atonement and on 2 Samuel 12.12-13, I honestly found (and find) it an unclear paragraph. I could not tell if you were saying I hold a Christus Victor view but it does not avoid Glenn’s charge of injustice in the atonement on my unitarian Christian conception of God, or whether you were saying I just have no real explanation at all. It seemed you could be saying either. I guessed something like the former. At any rate, the entire post is quite frustrating to read. Yes. Why would you assume that I had not? I said that if you reject all satisfaction theories and Christus Victor too then there is really no good reason “why Jesus needed to die at all.” This does not mean that I don’t know that other theories of the atonement have ever existed. It only means that I do not think that they offer a credible account of why Jesus needed to die. I agree, this conversation does not promise for much progress. And we do not agree as to the cause of this, either. I think you are resistant to seeing the argument from Justice even though it has been explained to you. You, evidently, think that I (like Glenn?) am just blinded by Trinitarianism. First, you say you have heard of the other theories of the atonement I listed but deem they do not offer a credible account of the necessity of the atonement. Okay, then will you tell me in your own words what is the governmental theory? In the end you say that Jesus died because God had to give something up in order to forgive sin. This makes no sense at all. Forgiving sin is giving something up, because God will no longer punish those whose sin is atoned. That’s what is given up. For God so loved the world that he gave his only begotten son . . . He who did not spare his own son but gave him up for us all, how will he not also along with him give us all things . . .
Is not the heart of the New Testament gospel message that God has given his precious son, has sacrificed his only-begotten son, in order to forgive us of our sins? Yes God “gives up” the punishing of our sins, but that is not all he gives up! He gives up his son in order to forgive our sins. Right? I’m happy to answer your questions, although it looks like your first question is an attempt to test me, to see whether I know what I’m talking about. I’m not overly appreciative of it, as though you doubt my earlier claim to know about the various theories of the atonement. I was certainly telling the truth, if that’s what you’re trying to find out. The moral government theory (developed by Grotius – 17th century?) is that God punished his Son with the punishment that is due for sin, but that the Son was not punished on behalf of anyone else. He was simply punished as n innocent victim, showing us all how seriously God takes sin, so that we would be horrified at how terrible it is. It’s like a mirror image of the moral influence theory. Then, having poured out his wrath against sin on Christ, God’s own Son, God can extend mercy to us. In answer to your second question: David’s son died to punish David for the evil that David had done. I note that you have already agreed with Glenn that David was punished here. Thirdly, I note that you agree that “Yes God “gives up” the punishing of our sins.” That is good. I agree that in Christ he gave up his life as well – of course (but you believe he gave up somebody else’s life, more on this below). But it’s not that God had to give something away in order to forgive sin – e.g. just to suffer in some way or lose something. Specifically what God had to give up is the ‘right’ to punish sin. And as I have said, a just way to do that is for him to absorb the loss himself. But you have him taking an innocent third party and pouring his punishment / wrath out on that third party. A party who is not guilty, and a party who is not the wronged party. The problem of justice is not going away, and I don’t think you’ve managed to address Glenn’s challenge at all. I’m not trying to test you in a mean-spirited way regarding your understanding of atonement theories. I’m trying to gently show you that you do not understand at least the governmental theory, which is why you do not understand what I wrote on the atonement. The governmental theory above all–above all!–insists that Jesus was NOT punished by God in any way whatsoever. So with all do respect, your description of the theory as God punishing an innocent Jesus could hardly be more inaccurate. I’m not saying this to be mean or rude. That really is about the most inaccurate way I can think of to describe the theory. I can only recommend carefully reading what I wrote and/or reading some of the classic statements of the theory (I linked a very accessible article above, you will recall), for you are rejecting a misunderstanding of the theory, not the theory itself. And in my studied opinion, the governmental theory provides the true explanation for the necessity of the atonement. Most Christians have no idea of the prominence this theory once held, especially in the United States. Penal substitution or an Anselmian-type theory is simply taken for granted, or if it is opposed, vague “Christus Victor” theories are interposed. All the while, the governmental theory so carefully explained and defended for so many years is ignored or misunderstood. Regarding the death of David’s son. Yes, the son was put to death as punishment to David. And I did not agree with Glenn on this as if I had ever denied or doubted it. But why did God do this according to 2 Samuel 12:14? God specifies the reason in that verse. That is what I was trying to get you to see. At any rate, I already explained it in my post above on the matter. But you have him [God] taking an innocent third party and pouring his punishment / wrath out on that third party. A party who is not guilty, and a party who is not the wronged party. The problem of justice is not going away, and I don’t think you’ve managed to address Glenn’s challenge at all. I absolutely reject that God poured out punishment/wrath on Jesus. That is a most disgusting idea. God does not punish the innocent, much less his beloved Lamb without spot or blemish. Any theory of the atonement that says that is clearly false and clearly makes God unjust. Moreover, even if Jesus was God, he could not be punished for the guilt of others. Nor could he somehow pay their debt back (the more Anselmian idea Glenn seems to be presupposing). Guilt simply cannot be transferred, and it is unjust to punish the innocent for the guilty, as I already said. And what we owe God cannot be paid back to him. Glenn’s monetary analogy is quite misleading. As God’s rational creatures, we owe him our fidelity. But we have all failed to be faithful to him. He offers forgiveness through Christ, but hte previous infidelity and even continuing infidelity of the forgiven can never be paid back to God, not even by God himself. Again, it’s not like we stole $100K from God and we, he, or Jesus can pay that back. That’s like thinking of a cheating husband somehow paying his wife back for cheating on her. Frankly, it appears the charge of divine injustice in the atonement if Jesus is not actually God presupposes a penal substitution or at least Anselmian theory of the atonement. But the presupposition is false. It’s really that simple. If you and Glenn continue to presuppose such a theory, then clearly you will continue to believe unitarian Christians make God unjust in the atonement. And that is unfortunate if it keeps you from reconsidering your trinitarianism. As I already clearly said, according to this view, “God punished his Son with the punishment that is due for sin, but that the Son was not punished on behalf of anyone else. He was simply punished as an innocent victim, showing us all how seriously God takes sin.” This was entirely accurate. If you do not understand the governmental theory to teach this, then you do not understand it. You may wish to consult Grotius’ work where he developed the theory: Defensio ﬁdei catholicae de satisfactione Christi adversus Faustum Socinum (A defence of the catholic faith of the satisfaction of Christ, against Faustus Soninus). If you reject as “disgusting” the idea that God poured out punishment on an innocent third party then you should give up the governmental theory, since as a Unitarian, you think Christ was indeed an innocent third party. Regarding the death of David’s son, you say that you are simply happy to let your earlier comments stand. Very well, they have already been addressed. I don’t think there’s much more to add. The precepts of classical theism are very attractive to me. They make a good deal of sense, they’re intellectually stimulating, they haver been argued for by may of the great theologians. There are no philosophical arguments which I consider to be a serious objection to classical theism. But I have always considered Jesus’ death to offer the greatest objection, and I have always found the two natures doctrine hopelessly frustrating on an intellectual level. Because of this I have flirted with process theology, but ultimately I think that raises far my questions than it answers. The tension inherent in the Athenasian creed is, I think, well expressed in the sometimes friendly rivalry between the Lutheran and Calvinist/Reformed readings of that orthodox creed. The Lutherans teach that we MUST be willing to say “God died” without qualification. They warn that if we can _not_ say that, we veer into Nestorianism. The Reformed, on the other hand, warn that if we fail to carefully distinguish the natures of Christ (which the creed says we can do) we will confuse them, resulting in the error of Eutychianism. The best single source I’ve found that discusses this tension (and the two natures of Christ in general) is a long audio series by a Lutheran, freely available from http://www.fightingforthefaith.com/2010/11/two-natures-in-christ-part-1.html (and in other links searchable from that site). He does get to the tension well before the 14th episode, and I think in fact it’s one of the first episodes. The Penal Theory and Moral Government has its problems. Sandra, drive by links are generally not allowed (please read the blog policy, which you’ve agreed to). But if you want to offer some thoughts on this blog article, that’s fine. “For God so loved the world that He sent [SOMEONE ELSE], that whoever believes in [SOMEONE ELSE] shall not perish but have eternal life.” I think it turns the gospel on its head. How does someone else saving us show that God loves us?! That someone else was his son. The most precious to him. His son was willing to go through with it. It adds more worth in my view. 2 tremendous acts of love. 2 entities with tremendous love for mankind. Jesus was exalted by God, given unique privileges ( more authority) and also learned obedience from the things he suffered. Imagine that you are standing in the yard with your son, Micky Jr., while your daughter plays in her second floor bedroom, and before long you notice smoke and flames are coming from the kitchen window and they are quickly spreading through the rest of the house. Because of your deep love for your daughter you exclaim to Micky Jr., “Suzie’s in danger—go inside and save her!” Without hesitation your son does exactly what you ask and he rushes into the blazing house. From your safe vantage point outside you see that he has made it to her bedroom and you eagerly wait for them to get out before it’s too late. After what seems an eternity you hear the crashing of glass as your son breaks a lower-level window, and from the thick, black smoke you see a smoldering bundle being pushed hastily through the opening. You grab your daughter as she struggles to get to safety; unfortunately, the smoke and flames overtake son and he dies alone inside the house. After the smoke has cleared and some days have passed, you stand before a gathering of friends and family at the funeral of your beloved son where you tell them that your son’s selfless, heroic and heart-wrenching sacrifice to save his sister is proof of YOUR great love. • How does Micky Jr’s sacrifice to save his sister illustrate how much you love her? • Why didn’t you, the father, sacrifice your life for your daughter and thus spare your son by doing so? • Does this story illustrate how much you loved your daughter, or how much Micky Jr. loved his sister? My point was that if God had a third party die for us, like Glenn said, then it turns the whole gospel on its head because then much of the biblical language in reference to Jesus Christ seems rather unjust. If Jesus Christ was not God, but was rather a third party, then passages like John 3:16 really mean that God loved us so much that He asked someone else to sacrifice himself for us, but in reality the sacrifice that Jesus made for us demonstrates how much Jesus loves us, not how much the Father loves us. Thus, this verse is a meaningful statement only if Jesus shares divinity with the Father, because only then does the Father likewise share in the sacrifice for all mankind. Only then can the Father claim credit for the sacrifice that Jesus Christ offered, which is something He does repeatedly in scripture (e.g. John 3:16, Romans 5:8). I don’t think the illustration fits for many reasons. In your illustration death in the house fire is the end for the human Micky Jr. The worse case scenario is Micky Jr dies in the fire and death is the last thing anyone wants to happen in the illustration. A death with no meaning, no hope, preventable etc. Obviously the death of Jesus whether he is God or not can not be compare to the situation but it is a foreknown sacrificial death with many positive consequences. What about in the illustration Micky is 2 people as one so he says I will go and rescue her as myself, or no wait as Micky Jr. It all starts to get muddled from this part with more confusing outcomes than first scenario. As for the Immanuel reference if God parts the red see God is with you by means of his actions. I understand Jehu to mean God is here! As I see it, the differences between Frank’s analogy and reality that you point out, Micky, do not take away from the force of the analogy itself. Analogies always have differences from reality. I thought it worked perfectly.